I recently picked up a tube of Jordana Best Lash Extreme Volumizing Mascara from my local Walgreens for about $3. I have heard rumblings about it for a few months, and as I am coming to the end of my deluxe trial sizes of my higher-end mascaras, I thought I'd pick some up. Jordana does not come in any fancy packaging. It is just the tube in plastic shrink wrap. The wand is a small spoolie; my favorite! The first few applications are very globby. The formula is very creamy, and it likes to stick to itself. You can comb it out with the spoolie, but you'll have to be patient. After a week, the formula has become much easier to work with. It still globs up a little, but it takes far less work to comb it out. 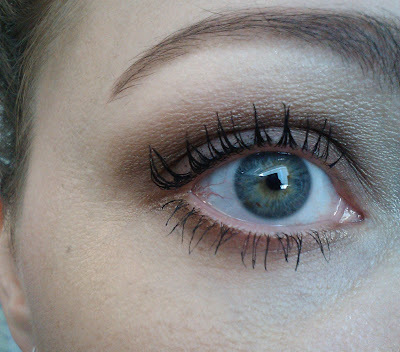 I found that it stayed in place all day without smudging or running, IF my undereye makeup was set with powder. If I left my concealer creamy, it tended to lift a bit from my lower lashes and smudge. Keep in mind that my lower lashes are pretty long. It washes of pretty easily with water, and a bit of almond oil quickly removed everything else. Overall, for $3, you really aren't going to go wrong here. It works just as well as those higher-end mascaras I have been testing, with the exception of it being a bit globby (not clumpy, the globs are not hard, just goopy). I really like how it adds volume without getting spidery. You can keep on adding layers, but my lashes are so long that more than one good coat makes me look overdone during the day. Have you tried Jordana Mascara? What do you think?